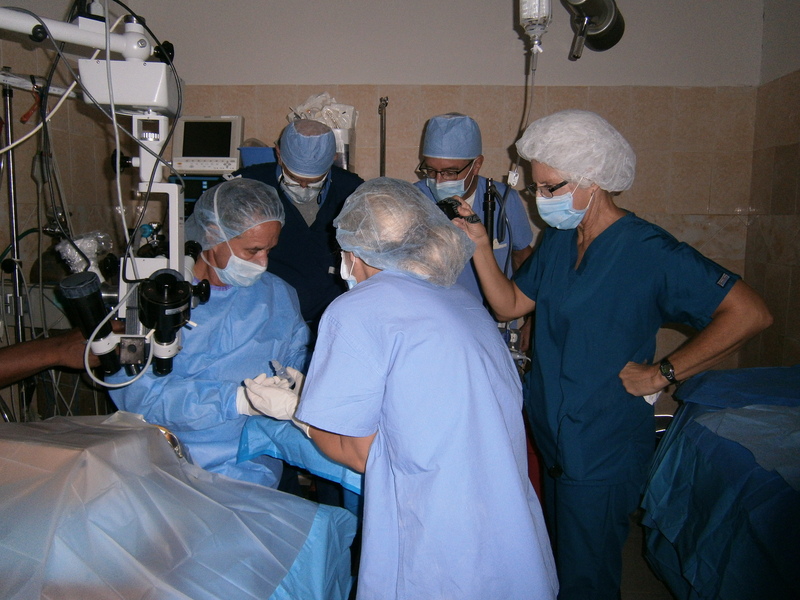 For the first time ever, cataract surgery was done last week in Montrouis, Haiti at our nearby hospital in Pierre Payen. Not only was cataract surgery done, it was done with the same state-of-the-art, small incision, no-stitch procedure currently done in the US called phacoemulsification (or ‘phaco’). To our knowledge, this is the only phaco machine that “resides” in Haiti. From two teenage type 1 diabetic girls to several patients in their sixties and seventies, Haitians who were blind or nearly blind from their cataracts were operated on by Dr. Eric Purdy from Ft. Wayne, IN during the four days of Oct. 29-Nov. 1. One of the many highlights of the week was the impact the surgeries had on the lives of two diabetic girls. Teenage diabetic girls first day after surgery! From the minute the patch came off the eye on post-op day one, one of these girls was able to see her sister for the first time in two years! Smiles and tears flowed for all in that room. In fact, both of these girls did so well with their cataract surgery on the first day that they had their other eye done on the last day of the week. All one-day post-op visits were very encouraging, and their one week post-ops are being done this week.The idea of providing cataract surgery began last February when a partner of New Vision visited one of our eye clinics and witnessed the overwhelming number of untreated cataract patients. When told that very few patients had access to affordable, quality cataract surgery, the dream was launched that would ask God to address this huge need. Dr. Purdy was consulted and gave countless hours of telephone and email time explaining how to make this happen from his many years of doing cataract surgeries in third-world countries. Not only did he freely offer his invaluable advice, he agreed to come down the last week of October to do surgery. Then, another special friend of New Vision was moved by God to provide resources that enabled quality cataract surgery equipment to be purchased. A bus was provided that could transport the heavy, bulky operating microscope, stands, stools, examination chairs, and many other supplies that were needed. Through the prayers of many, many people, God graciously delivered the bus just in time for the scheduled week of surgery! We stand in awe of our amazing God! He is a mighty and loving God who loves us in a way we’ll never comprehend, and has a special heart for the hurting and needy of this world. May this ‘new vision’ of our patients impact them and us in a way that ‘opens our eyes’ to the unfading beauty of Jesus! What a privilege we have to be part of His care to those around His world. May we never lose ‘SIGHT’ of that! Our new New Vision Ministries bus arrived this week, and what a celebration it was! The work and contributions of so many that began last February came to fruition as Dago drove it into the mission at 3:30 pm this past Wednesday afternoon! From school supplies to eye examination and cataract surgery equipment to Breedlove meal packs to sound equipment, this bus was full of blessings from God for Haiti. Join with us in praising Him for providing such a quality vehicle that will serve many purposes for years to come. In general, Haitians are very patient and amazingly tolerant of their very poor living conditions. However, every now and then, they become frustrated and want “their voice to be heard”. The common way they do this is with what’s called a ‘manifestation’. They do something very visible in one of the main roads, such as turn over a car and set it on fire, drag a bunch of tires out in the road and set them on fire, create a roadblock, etc. This past Wednesday they turned three semi-trailers crossways in the main road running through our town and blocked all traffic for a couple of hours. Finally, the police came and dispersed the crowd and got the semi-trailers moved. We were going to Port-Au-Prince that morning to pick up one of our ministry partners at the airport at 9 am, and were fortunate to get there by 10 am. Today, ‘the restless ones’ were at it again as they built a wall of large rocks in the middle of the road and stopped traffic most of the morning. They also set up a second barricade at the (only) bridge and stopped traffic in a second place with a crossways semi-trailer. The main road through our town is the main (and actually the only) north-south road in Haiti from Port-au-Prince to St. Marc and on up to Cap Haitien. So what are they protesting? Lack of electricity. As the city of Montrouis gets ready to celebrate its birthday on June 24, the level of frustration over the lack of electricity is intensifying. Unless you are fortunate enough to have your own generator (or solar panels – which are very rare)… AND have the money to continue filling your generator with gas or diesel, you don’t have electricity. Government-supplied electricity is essentially worthless – maybe 6-10 hours a week, and you never know when those precious few hours will come. We also think of the many people here who were affected by the road closure – those who needed to get to and from the airport, conduct business, get necessary supplies, or make an emergency trip to a hospital. For sure, this present life is full of frustration and problems, whether you live in Haiti or America. As we think about this life’s temporary troubles, we pray they’ll cause people everywhere to look to the One who offers the only real solution to this life’s GREATEST need… new life in Christ! We’ve asked ourselves that question, and we imagine that some of our friends, family and acquaintances have as well. Here we are, back in Haiti after a three-week trip to Indiana. We experienced the joy of seeing our baby grandson again, celebrating the upcoming birth of another, and watching our family grow through the marriage of a son and now daughter-in-law. Visits with children, parents, siblings, and friends were so special. We continue to be blessed with good health. Life is good. So with all this great stuff going on in our lives, why does it make sense to be away from it all and live in Haiti most of the time? Because what we continue to believe and experience is that obeying God’s call to serve Him in Haiti is what really makes sense. Yes, God CAN move mountains! In our case this past weekend, God moved eight refugee families TO the mountain to live in new duplex homes! We praise GOD for making this happen. New duplexes just finished for 8 refugee families! Handing over the keys to a proud new family. construction company from St. Marc finished their work within budget! (How often does that happen?!!) As we learned how to get lots of water up the mountain for mixing concrete, the hand of God became more and more evident to all. GOD CAN move mountains of obstacles, and He proved it once again. We rejoice with these families who now have permanent places to live. Celebration Ceremony with all the families. We praise God for providing a one-year lease renewal on our current mission building that houses our children’s home. We continue to pray about the long-term plans God has for these dear children. The kids are doing well, and we’re thankful for the progress they’ve made in school this year. The first duplex for 2 refugee families is finished! The first of 4 duplexes was finished during February, and the final 3 are now under construction. They’re projected to be done later this month. We praise God for how smoothly the construction has gone! Our buses and pickup have been repaired, and are ‘back on the road again’. We still have a Ford Excursion that needs heads replaced, so if you know of a Ford diesel mechanic out there who wants to find some warmer weather for a week or so, we have all the parts and tools ready to go. Just let us know! The medical building partnership we formed with Life Connection last fall is going well as Dr. Tom and Sara are doing medical clinics two days a week, and Dr. Dennis is doing eye clinics 1-2 days per week. We’re putting together multiple ideas for using the “Community Center Building” that we built last year in the fishing village. These include moving the English and Creole (literacy) classes there, as well as the Bible studies that have been going on at the fish house. The Indiana team was able to finish the electrical in that building, and Stephen Byxbe’s medical team did clinics there for two days at the end of January. The long-awaited container from Barbados was released at the beginning of February. We’re now waiting to find out how flexible the donors are in allowing us to utilize the various materials, especially the wood and roofing materials. We’d love to use them to finish the many damaged and incomplete homes of our friends and workers. We know of a few children we would love to sponsor for school this year, even at this late date! They’ve recently been dismissed from school for lack of payment, but had been attending since October. If God is leading anyone to consider this need, it takes $200 to sponsor a child. The fishing program has hit a snag, and we’re presently in the process of restructuring the ministry. Please pray for us and the fishermen that God would have His way in everything. The women’s ministry is also undergoing a re-design that we pray will foster a more responsible attitude in each of the women. Some of these changes are necessitated by the shortfall in donations to the ministry. We’re trusting God to meet our needs. Please pray for us as we seek to use the funds we have according to His will for this ministry. Thank you for your prayers and partnership with us here. We love you, miss you, and look forward to hearing from you when you can. God bless you.